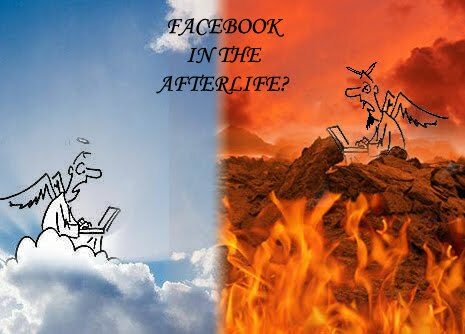 The Blog of Dr. T. Michael W. Halcomb: Checking Facebook In The Afterlife? Checking Facebook In The Afterlife? Within the last year or so, I have noticed a trend that I not only find odd but a bit troubling too: R.I.P. messages on Facebook. Now, don't get me wrong, I understand the loving spirit in which people leave the deceased messages. I mean, I've visited many grave sites in my lifetime and have left flowers on the grave of my loved ones. Yet, never did the thought cross my mind that my loved ones saw the gesture and rejoiced over it; I always knew that it was more for us than them. This was something we did to remember them or to honor their memory. We did not go to the grave site and talk to the headstone thinking that the person could actually hear us. No, we went, put down the flowers as a family memorial and then spent time reminiscing with one another (those physically present) about our deceased loved one. So, when I see people leaving R.I.P. messages to their loved ones on Facebook, as I said, I am a bit dumbfounded. Why are people doing this? Do they really think that their loved ones are checking their Facebook wall in the afterlife? If so, then why isn't the loved one updating their status, liking comments or leaving replies? What is this gesture all about? Besides this, it is clear that EVERY person believes their family member or friend is in "heaven" reading their Facebook messages because nobody's loved one could ever go to hell, right? I find in all of this a very odd and bothersome theology. From weird ideas about communicating with the deceased to having the latest social media in the netherworld, I am troubled. Even more, I must ask my Christian brothers and sisters a question: What theological or scriptural basis do you have for leaving R.I.P. messages on Facebook? Even temporarily putting aside the question of whether or not people go to some spiritual place such as heaven or hell as soon as they die, I must also ask: Have you let technology and media shape your theology more than scripture and the traditions of the church? Over the course of the last few years, several friends have died. Unfailingly, when this happens, their Facebook pages remain up and people begin posting on their wall, as if the one who has passed can actually read what is being said. The same has happened with celebrity deaths and their Facebook or Twitter accounts. All of this has made me pause and ask, What in the world is going on? Are Christians on a slippery slope to unfounded beliefs, which are being ingrained in them by the media and technology of their day? If so, what must we do about it? I hope to think through and write more about this in the near future but for now, I am curious as to what others think? You can go ahead and leave a message on Pisteuomen or my Facebook account because as of now, I'm still alive and can read your messages, heck, I can even respond to them, so, let's talk. Keywords: Facebook in heaven? Facebook in hell?